HMH Books for Young Readers, 9780544540064, 304pp. Inspired by 12 years working with at-risk teenagers as a teacher in a behavior support program, Catherine Lo is the author of How It Ends. She lives in Ontario with her family. treatment of mental illness and risky behavior is refreshing, hard, and necessary." "Lo skillfully shows how the girls’ very different past experiences affect their perspectives; anger and jealousy... complicate matters, and both girls spiral downward before they can learn to trust again. Despite dark moments, Lo’s novel is an inspiring read, revealing the power of courage and compassion." "A thoughtful depiction of teen friendship and the competing costs of concealing—and revealing—the truth." "As harrowing and realistic a look at the life cycle of a young friendship as I've ever seen. It's by turns funny, warm, soulful, and heart wrenching. The author's work with teens shines through in her razor sharp dialogue." 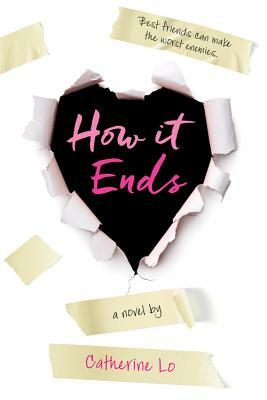 "How It Ends is a realistic story about the beautiful complexities of friendship, from the first meeting to the first betrayal, and all the secrets and self-discovery in-between. Totally compelling."